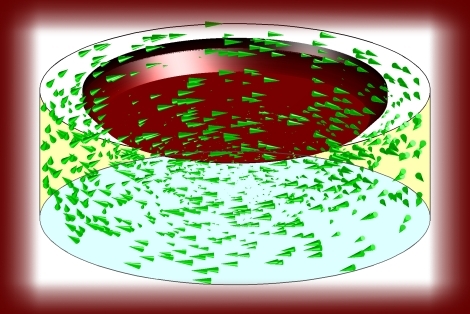 Basically, the theme of this thesis is rheology and non-Newtonian fluid mechanics of viscoplastic fluids, measurements, computational rheology and CFD. The above figure is from page 264 in my thesis (Figure 10.30). It shows the velocity profile inside a modified cone viscometer. For this figure, a Bingham fluid is applied with yield value and plastic viscosity of 200 Pa and 20 Pa.s, respectively. The top red region is the measuring unit and is stationary, while the rest of the boundary consist of a rotating bucket (here, rotating at 3 rad/s). Wallevik, J. E. (2003); Rheology of Particle Suspensions - Fresh Concrete, Mortar and Cement Paste with Various Types of Lignosulfonates (Ph.D.-thesis); Department of Structural Engineering, The Norwegian University of Science and Technology, ISBN 82-471-5566-4, ISSN 0809-103X. Like in most/all textbooks and other written documents, typesetting error are always present. In the following download are some correction of the above mentioned textbook Rheology of Particle Suspensions: erratum.pdf. Also included are nomenclature of the major variables in the textbook. The Nordic Rheology Society engages people interested in rheology in the Nordic countries. Rheology is defined as the science of the deformation and flow of matter which means that rheology in some form enters almost every study of material properties. In the Nordic countries, rheological measurements have become standard techniques in both industrial and academic research during the last decade due mainly to great improvements in instrumentation. It was therefore decided in 1991 to form a Nordic Rheology Society as a meeting ground for engineers, physicists, chemists, biochemists, and biologists engaged in rheology. Jumping between openSUSE and Fedora is surprisingly easy. For example, everything I do with yum, I do (more or less) the same with zypper. Its a bit less buggy than the openSUSE in my opinion, but the latter is still great, supreme (since I can compile OpenFOAM 1.6-ext on it). Graphical support in Fedora is exceptional good. I use both Fedora and openSUSE. For those of you who want to blend Linux with Windows without rebooting, then the Cygwin/X is an ideal application. It includes important applications like LaTex2e, gnuplot, Xfig, g77 and so forth. These are nice to have alongside with other windows applications.